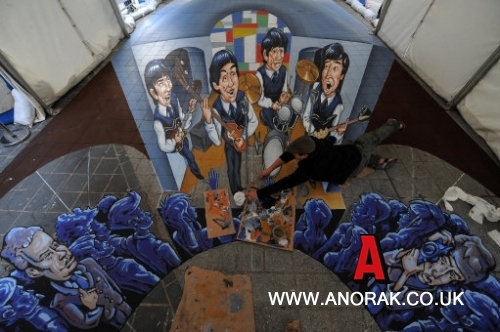 FANS of the Beatles should appreciate the work of 3D street painter Juandres Vera, from Mexico. He’s created XXL Liverpool, the world’s first dual anamorphic 3D work of pavement art featuring The Beatles in Liverpool. The 24m long by 6m wide work was commissioned to celebrate the dual 50th anniversary of The Beatles first gig at The Cavern Club and meeting their manager Brian Epstein. The Beatles drawing also marks thestart of off The James Carling International Pavement Art Competition. 3D street painter Juandres Vera, from Mexico, adds the finishing touches to the worlds first dual anamorphic 3D work of pavement art featuring The Beatles in Liverpool.